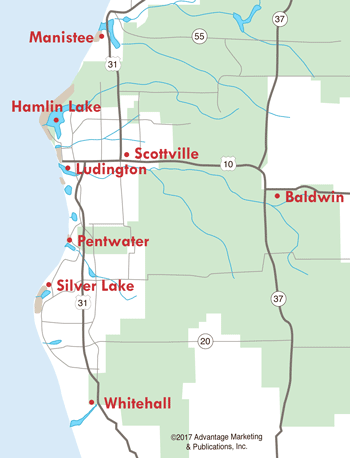 In keeping with the tradition of showcasing Ludington's history, "Hooked on Hamlin" has now taken its place among the other eight sculptures that grace Waterfront Park. 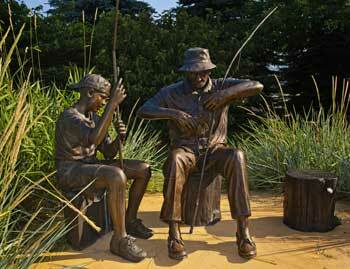 It features bronze statues of a man and boy fishing, with the man taking a fish off the hook. The sculpture represents the generations of families that have enjoyed fishing, boating, and swimming on Hamlin Lake. It holds a special place in the hearts of those that live along the lake--and for those who have spent their summer vacations on Hamlin Lake year after year. "Hooked on Hamlin" was created by artist W. Stanley Proctor of Florida, who also designed the park's first sculpture, "Follow the Leader." There are now nine sculptures at Waterfront Park, with no more planned for the future.